Dolls, in the left corner plant your kohl-rimmed peepers upon Yves Saint Laurent’s pretty Palais Suede Platform Pumps – the very same stunners seen donned by Vanessa Hudgens, Carrie Mulligan, Heidi Klum, Alexa Chung, Olivia Palermo, and Jessica Simpson; in the right corner take in the amazingness that is Kelsi Dagger’s Abrielle in Royal Blue. Though Abrielle is a slightly paler hue than that of the posh Palais; for just $129.00, in comparison to the $720.00 price tag of le Yves Saint Laurent lovely, they are every bit as capable of lending a sprinkling of star style to your shoe collection – at a price fit for a frugalista! 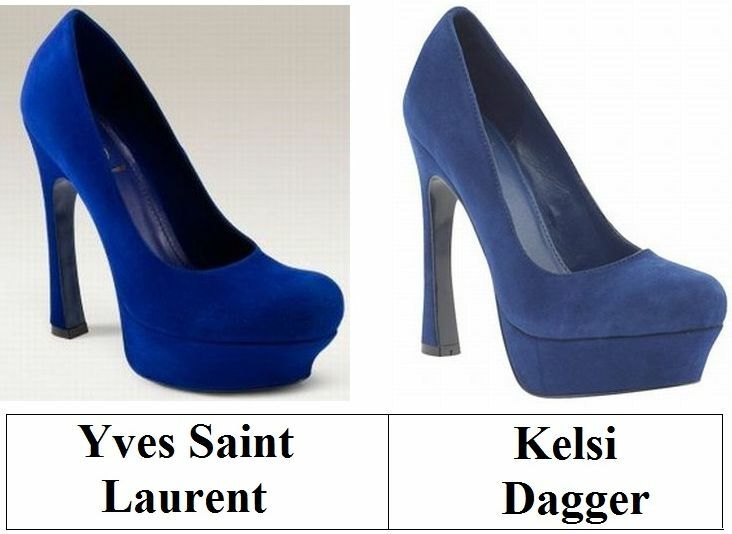 Tell me, kittens…will you be a big spender and go for Yves Saint Laurent, or be thrifty and spring for Kelsi Dagger? Thank you to Nordstrom and Piperlime for the pictures. Wow, they are a lot a like. I would have to go for the steal..just because. Very cool find. Oh, I love them, but I can't see me ever wearing them. If I did, I know I'd fall. I would go for both, honestly, because the intensity of the blue is different. These heels are lavish and I really like them. Good find, E. I hope your Halloween was fun! If I wasn't already so tall I would gladly rock those YSL pumps! The color is gorgeous! They are both an awesome shape but I do like the more vibrant color of Yves Saint Laurent. Hope you had an awesome Halloween! These are such a good replica--although the hue of blue is really quite something. I was just in the YSL store this weekend and everything is so beautifully made. Although blue shoes are quite the splurge! Great find Erika! These are fab. I don't know if it's because of the lighting, but I prefer the darker color of the YSL pumps. I am still droling over those shoes! I even saw one pair at Guess store! these are so similar! not sure if I'd personally buy this shoe but I love the blue and I just recently saw the AMcQ punk ones with the skull - adore. as much as i love the ysl, i think it'd have to go for the steal. they look just as cute. Oh wow they are almost identical!!! That brilliant blue is pretty spectacular! Great match! I love the Kelsi Daggers. I like how bold the YSL's coloring looks. YSL sans hesitation. A gal just has to have some killer heels. Electricity is in the air! omg, YSL's just pop SO much better, hard to not say those ones! These are beautiful. Even the cheaper ones are very cool. Really gorgeous. I do love the BLUE in YSL! I have lusted after these YSL's for a long time...lust no more! Kelsi Dagger here I come! awesome! they are exactly the same! Ooo, blue heels are so pretty! I love the YSL ones. Both pairs are lovely! These would look so cute with a LBD. I like the richer hue of the Yves Saint blue heel but Id much rather take the price of the Kelsi! While they are both amazing, I am really digging the shade of the YSL pumps! Definitely lusting after the YSL, but alas...cannot get either. Stupid budget. I do like the YSL!